Dr. Vijay B. Metgudmath is a Specialist Cardiologist with extensive clinical and interventional experience spanning over 9 years and have performed more than 4000 procedures. 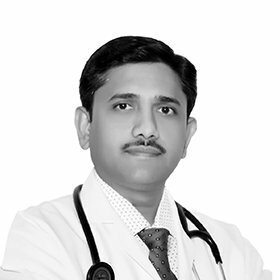 JAWAHAR LAL NEHRU MEDICAL COLLEGE, KLE UNIVERSITY(Belgaum) and as Unit Head and Consultant Interventional Cardiologist and Director of (ECHO AND TMT) Lab in Dr P.B. KORE HOSPITAL AND MRC (Belgaum) which is a 2200 bed multispecialty tertiary care hospital and MRC.